"Just be sure you don't hit the wrong button and end up putting a photo of your junk on Twitter. Trust me, you don't want those followers." Following on the firestorm caused by my screed against the use of the center stall in the office restroom, CNN has published a story called "Restroom Etiquette for The Office." Or did they? Oops. It looks like they decided the world wasn't ready to be told what not to do in the bathroom by CNN, and pulled the story. Fortunately, it's still available on Google's cache as well as the mobile feed. The article makes some very solid points, by advising bathroom newbies with sound advice such as flush the toilet and don't drip on the toilet seat. The authors do, however, veer into highly controversial territory, by openly opposing talking across the stalls. While the authors do admit that this is more personal preference than etiquette, they go one step further by suggesting that this applies to urinals too. Personally, I think they walked off the cliff on this one. Talking across stalls, maybe, but urinals? Any society that is so uptight that chatting with your co-worker while peeing is verboten has really gone too far. Bear in mind that there absolutely must be an empty urinal between you during this conversation at the clivas multrum. If for some reason you are forced to pee right next to someone, especially someone you know, then the only appropriate way to handle this is with absolute silence and a level gaze. Just pretend it's not happening. Which brings me to the failings of this article, and indeed, the failings of mainstream media in general. While the subject matter is one of great relevance, it fails to deal with what is truly important, the meat of the subject. The issues they discuss, such as talking across bathroom stalls and talking on one's cell phone while using the toilet, are important ones. Yet much more serious matters are left unexplored. And cell-phone use in the bathroom is hardly breaking news. Brad Pitt came out against it publicly in July, strongly urging people to only communicate via text message while in the bathroom. His marriage to Angelina Jolie notwithstanding, Mr. Pitt is indeed a wise man. State secrets have been compromised through idle cell-phone chatter in the bathroom. And his bold comments further highlight the shallow failings of the present CNN article. While they correctly decry the practice of talking on the phone in the can, they don't even bother to say that texting is perfectly fine. Nor do they warn of the risk of photographing your junk while using your phone in the restroom. Where's the depth, the analysis? The horror stories of twittering your junk accidentally? 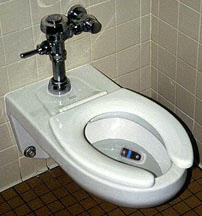 What about dropping your phone in the toilet?!? In the end, while it does bring some hope that such matters are being discussed at all, we at Farm Fresh Meat strongly believe that the media could be doing much more. Discussion of bathroom etiquette has languished in the shadows long enough. It's time that everyone -- not just the media, but all of us -- took a stand and pulled back the curtain on this awkward subject. Stand up for proper bathroom etiquette. Call out your coworkers and friends when they use the center stall or talk across the stalls. If everyone works together, like Polio, bad bathroom behaviour can be eradicated. so... what would happen if there are 4 stalls? what is appropriate etiquette then? A four-stall setup represents poor bathroom design, since it's impossible for more than two people to use it at the same time without violating the code of conduct, resulting in two rather than one wasted stall. These are rare. However, in a 4 stall setup, you may use any stall since the 2nd user will always have a stall that's not adjacent to you no matter where you sit. So, if we iterate, the ideal bathroom design is that with N stalls, where N is always an odd number. The ideal bathroom design would include a neutral zone between each stall. Sadly, as a society, we have a long way to come to embrace this civilized notion. Talking across urinals violates man code. Eyes forward with blinders on. The only exceptions are if you arrive at the same time and if you know the other person. Otherwise, that's just creepy. My cousin has pee terrors. He can't go when anyone else is in the bathroom with him. It's pretty funny at bars. @Mr J - I think the more important part of the man code is that you do not use the urinal adjacent to someone else, except while at a rock concert or sporting event. In which case even the sinks are fair game. So while I think it's OK to talk to someone (who you know of course) at the urinal, it absolutely cannot create any risk of an accidental glimpse of someone else's junk. Talking to someone you do not know in a bathroom is essentially the same as a gay proposition. This is really a big issue. How come people just do not know how to flush the toilet after they use it, or keep the area dry and clean? It is really a very basic thing to do and yet a lot of people just do not give attention to it. Toilet etiquette is really important because it shows one’s overall character. People should start changing their bad behaviours. This is for the good of everybody. Thank you for this post.